The Nexus 7 from Google has been a real breath of fresh air to the tablet market. Not only does it offer a solid performance on Android Jelly Bean, but its low price has lured in many consumers into grabbing a device they perhaps wouldn’t have been able to afford. Google outdid itself by dropping the price of the popular device earlier this week, and while this will no doubt increase general consumer interest and subsequent sales, it has left those who paid the original prices feeling a little underhanded. 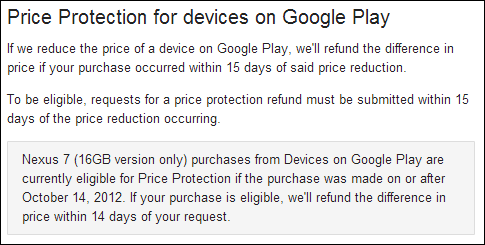 In order to maintain the peace somewhat, Google has rolled out its Price Protection scheme, in which those who purchased their 16 GB Nexus 7 in the last 15 days will be given a partial refund. The system, which is effective across the search giant’s entire product range, means those who’ve recently grabbed the 16 GB slate won’t feel ripped-off, and if you send an enquiry today, you’ll get your $25 back within two weeks. 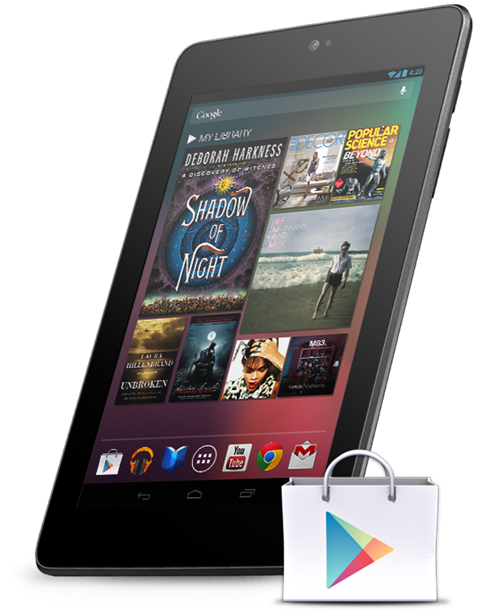 Nexus 7 (16GB version only) purchases from Devices on Google Play are currently eligible for Price Protection if the purchase was made on or after October 14, 2012. If your purchase is eligible, we’ll refund the difference in price within 14 days of your request. Those who didn’t quite make the 15-day refund period may feel a little hard done-by, but even at its previous retail price, the 16GB tablet was still a pretty good deal. I’ve had the 16GB version since it first came out, and even a few months down the line, I still use it on a daily basis. Having had some experience with the iPad mini and Kindle Fire HD, I still believe Google’s offering presents the consumer with the very best value for money, and with an even lower price now, it’s certainly going to continue selling well this holiday period. If you’ve been waiting for the Nexus to drop in price, now would be a good time to pick one up, and if all you’re looking for is a budget tablet experience, I’d strongly advice you opt for a 16GB Nexus 7. Manufactured by ASUS, it may not boast the best of build qualities, but if you can look past this fact, it’s a good investment. Or, if you’re planning to step things up a notch in terms of content storage, then the 32GB Nexus 7 might be the right tablet for your taste.